Democrats will probably get their way on most policy matters over the next two years, but bipartisan accomplishments won't be easy. Congressional Republicans won their elections too, and they didn't do so by promising to agree to everything that Democrats want. Yes, Democrats have the votes to muscle through a lot of bills without much Republican support — or any, as the stimulus package passed by the House this week shows. But on some occasions Republican support could be useful. Take Social Security, which President Obama has suggested he wants to reform. A strategy that is supported only by Democrats could result in their having to take full responsibility for a tax-heavy bill, and some would balk at that prospect. This means that the most likely result is inaction. This, after all, is what happened when Republicans tried to reform Social Security. President George W. Bush proposed restraining the growth in benefits and allowing young workers to invest some of their payroll-tax contributions for themselves. In 2005, Democrats almost unanimously believed that personal accounts "carved out" of Social Security were a deal-breaker. Instead, they wanted to raise taxes, especially on high earners. They also thought that young people, especially those with low or moderate incomes, should be encouraged to build capital in savings accounts — but only if these accounts were "added on" to Social Security and seeded with tax credits. Congressional Democrats were not willing to cooperate with Mr. Bush, and Congressional Republicans did not want to take full responsibility for reforming Social Security. So nothing was done. The stalemate continues today. To break it, each side will have to give up at least one cherished goal. Republicans must accept that Mr. Bush's dream of letting individuals invest Social Security funds is dead. In return, Democrats will need to take tax increases off the table. Click the link to read the whole article. I agree strongly with Ponnuru's thoughts, both in terms of the political feasibility of a deal and the shape such a deal should take. Update: Greg Anrig at TPM Cafe says "No deal" to Ponnuru's plan. Which is his right, but it's worth noting that he makes no suggestions on how he would go about fixing Social Security. Making Social Security solvent for the long-term will demand much more than the 'nip and tuck' that many on the left claim, and from a political standpoint I'm not sure I'd like to go to the country with a plan that keeps the system afloat entirely by raising taxes. It would be a mistake to confuse the failure of President Bush's reforms, which relied on benefit reductions and personal retiremetn accounts, for a national consensus in favor of raising taxes. As the House prepares to vote on the American Recovery and Reinvestment Act of 2009 (a.k.a the stimulus bill), the Social Security implications of the legislation have been only briefly noted. The stimulus bill does provide explicit funding for new initiatives at SSA. These include $900 million in funding to modernize computer facilities and better process disability and retirement applications. The bill also calls for the Commissioner of SSA to work with Homeland Security to better protect sensitive information and detect fraud. Yet beyond the technical changes, the bill could also impact Social Security's finances. The current plan, including a Republican-backed measure to provide relief from the Alternative Minimum tax, provides $342 billion in tax cuts. As Bloomberg reported yesterday, much of that money comes from an Obama plan to reduce payroll taxes. The payroll tax reductions come via Obama's Making Work Pay program which provides $500 to individuals and $1,000 to families in tax credits. (Andrew Biggs commented on a formative version of this plan to the WSJ during the campaign). While the rebate comes out of earned income, the credit for each year is set as 6.2 percent of earned income up $8,000. This is exactly the employee share of payroll taxes. Since many Americans already pay no income tax this provision would be a direct return of a portion of their payroll tax. Without transfers of general tax revenues, the provision would undercut Social Security's already dim finances. As the tax cuts are intended to be a boon to the economy, Congress and the administration are hoping that recipients will spend, not save, these rebates to spur demand. The plan also impacts Social Security by extending the terms for eligibility for the Supplemental Security Income. The program, which is designed for very low-income individuals with limited work histories, contains strict total asset maximums. Anyone exceeding those limits is disqualified. The stimulus package provides a one-time provision that places earners whose eligibility expired in the last two months because they exceeded the income limit back on the program. The Congressional Budget Office expects that 7.5 million individuals will receive payment immediately, and .3 million later in 2009. The plan is estimated to increase SSI outlays by $4.1 billion in 2009 and $.1 billion in 2010. The plan is far from a permanent fix for these retirees. Also click here to see Adam's work on pension reform in Argentina. Allan Sloan revisits the issues raised in a previous column, which I commented on here. He corrects an error regarding the personal accounts plan put forward in 2005 by President Bush. My mistake of commission was writing that under the plan proposed by former president George W. Bush's Social Security commission, people of limited financial means would have had to turn their private accounts into annuities when they retired. I was wrong. Retirees of limited means would have had the option of using their accounts to buy retirement annuities but would also have had the option of making small regular withdrawals. That's a big difference -- and a big mistake on my part, for which I apologize. This matters, because forcing people to buy annuities with their year-end 2008 balances would have locked in current stock market values for recipients' lifetimes. Making small withdrawals, by contrast, would allow retirees a chance to recoup their losses when the market recovers. Allan's general point – that the state of the stock market at the time you retire can affect how well you do under personal accounts – still has merit, even if I don't totally agree. But this column shows that he wants to get the details right and that he pays attention to people who disagree with him, which is what you want to see in a columnist. My AEI colleagues Alan Viard and Alex Brill argue that President Obama should go beyond the "fiscal responsibility summit" he has proposed and embrace the idea of a Congressional commission to address entitlements and the long-term budget gap. We congratulate President Obama for committing to tackle this issue. But the problem calls for more than just a summit. Rather than merely acknowledging the problem, Washington must move toward real and responsible action. While setting a pathway toward reform does not guarantee meaningful results, it may be the best possible first step. Congress should establish a bipartisan commission that would recommend legislation to narrow the fiscal imbalance, which Congress would then be required to approve or reject. Viard and Brill have some good ideas – count me as a supporter. Click here to read the full article. The key approach was to calculate the percentage of total benefits received by individuals paying a given percentage of total taxes. Here's a chart which helps explain things. The horizontal axis shows the percentage of total lifetime taxes paid by members of a given birth cohort, while the vertical axis shows the percentage of total lifetime benefits received. For instance, we can see that individuals paying the bottom 50 percent of total taxes receive around 61 percent of total benefits. This indicates that the program is progressive, if modestly so. Using these curves, we calculate a single summary measure based on the Gini coefficient. A system with no redistribution – meaning that people received benefits exactly in proportion to their contributions – would have a progressivity value of zero. Similarly, a system in which everyone received the same flat dollar benefit regardless of contributions would have a progressivity value of around 0.33. The progressivity value for current law Social Security is around 0.16, leading us to conclude that Social Security is (very roughly) around half way between a pure defined contribution program and a flat dollar benefit in terms of its progressivity. We also calculate how Social Security progressivity has changed over time, and how common Social Security reforms might alter overall system progressivity. There's some interesting stuff here, and thank my co-authors for all their hard work. Being fair to future generations requires that Social Security be reformed in a manner that effectively prefunds a significant share of future Social Security benefit payments. All serious reform plans have this property. Prefunding is attempted exclusively in the Social Security trust fund in some plans, and it is attempted partly in personal retirement accounts in others. Many analysts believe that Social Security surpluses are offset all or in part by lower non-Social Security surpluses. If the offset is 100 percent, then running Social Security surpluses does not increase the government's capacity to pay future Social Security benefits. In this case, reforms that rely on trust fund accumulations to make Social Security fair to future generations do so at the expense of a non-Social Security policy that is less fair to future generations. The evidence on whether or not trust fund accumulations pay down federal debt is of two general types: formal statistical analyses of historical budget data, and informal observations of budget politics. Mariger (2008) reviews the recent history of budget politics and concludes that there is a substantial probability that Social Security surpluses are in large part offset by smaller non-Social Security surpluses. To complement that study, this paper attempts to draw out statistical evidence from budget data. It is concluded that the budget data is essentially silent on the question of whether Social Security surpluses are truly saved. The reason is that the regression model specification is necessarily approximate, Social Security surpluses show little independent year to year variation, there are only 37 years of data, and spurious correlations mask the true relationships. Mariger does appear to agree with the above researchers, however, "that there is a substantial probability that Social Security surpluses are in large part offset by smaller non-Social Security surpluses." Follow-up: how would current retirees have fared if Social Security accounts had passed? The Washington Times editorial I posted earlier prompted me to run some additional numbers on how Social Security benefits for current retirees would have been affected had a personal accounts reform plan been enacted. In the Retirement Policy Outlook I published through AEI in November I showed that an individual retiring in 2008 who held a personal account his entire career would have increased his total Social Security benefits by around 15 percent. I also simulated full-career account holders retiring in years ranging from 1915 through 2008, showing that they would have increased their total benefits by between 6 and 23 percent, with an average increase of around 15 percent. But there's a reasonable objection to these numbers: not every worker would hold a personal account their entire career. In particular, had Social Security reform passed, many workers would have held an account for just a few years before retirement – and these weren't exactly the best years to be in the market. Those with only a few years with personal accounts prior to retirement could have taken large losses. So I ran some new numbers to test this idea. As before, I assumed that workers invested 4 percent of their earnings in a personal account holding a "life cycle" fund, which automatically held 85 percent stocks through age 30, then gradually declined to 15 percent stocks by age 60 and constant thereafter. Traditional benefits for account holders would be reduced by the amount they contributed to their accounts, compounded at the rate of return earned by government bonds. This is designed to make the traditional Social Security whole for lost taxes during working years. As before, I assumed an individual who retired at age 65 as of November 2008, when stocks were down more than 30 percent for the year. The difference here is that I simulated account participation beginning not simply at age 21, but at every age through age 64. So we get to see the effects of having a personal account through only part of a person's working career. This will tend to exacerbate the ups and downs of the market, since there is less time to recover and revert to the long-term average. The chart below shows the results. The full career worker receives a total Social Security benefit increase of around 15 percent, as in the previous study. (There are some very minor technical differences between the two, but nothing significant.) Total benefit gains decline through participation beginning at age 47, at which point the account holder would receive almost exactly the same benefit as someone who didn't choose a personal account. Individuals who began participating in a personal account at ages 48 through 64 would have lost money by doing so, but these losses would be very small: on average, total benefits would be reduced by only 0.3 percent. Moreover, even this figure may be misleading, since under most reform plan specifications individuals over age 55 would not be allowed to participate in accounts, for the very reason that they would not have enough time prior to retirement. Now, this exercise is hardly dispositive, and the usual caveats I made in the full paper apply. Yet, while anecdotal, this seems to me to be much stronger anecdotal evidence than the arguments that begin and end with, "Think what would have happened had personal accounts passed – wouldn't you have been sorry?" The Senate Budget Committee says it is prepared to tackle the third rail of American politics, Social Security, encouraged both by President Obama's remarks that "what we have done is kicked this can down the road; we are now at the end of the road and are not in a position to kick it any further," and by his commitment to not allow it to go past his presidency. Commendable. Also commendable was the Senate holding its first hearing on the nation's long-term fiscal outlook the day after Mr. Obama's inauguration, focused on fixing Social Security and Medicare. That drew praise from the budget panel's ranking Republican, Sen. Judd Gregg of New Hampshire. Before anyone gets carried away in rapture (or seniors mobilize a march on the Capitol), this kind of out-of-the-gate-action talk has been said before by many, including Mr. Gregg and recent presidents. Eight years ago a Republican-led Congress responded to the call of newly inaugurated Republican President George W. Bush to fix Social Security. Untold hours of expert testimony went on in numerous hearings during the 107th, 108th, 109th and 110th sessions about alleviating Social Security Trust Fund deficits by reducing benefits for high-wage earners and creating personal retirement investment accounts, using part of the current 12.4 percent payroll tax as an annual contribution. This plan would have worked had Democrats not been adamant in support of payroll-tax increases and in opposition to private accounts. Mr. Obama has attempted to show that if private accounts had been created within the system, those private account holders would be without retirement income given the current state of economy. But Andrew Biggs, a scholar with the American Enterprise Institute, points out that a person who began working in 1965 and retired in September 2008, even in this difficult economy, would receive $15,700 per year under the traditional Social Security. But if that worker were permitted to invest 4 percentage points of the 12.4 percent payroll tax in a personal account, he or she would have increased their total Social Security benefits by 15 percent. For workers who chose personal accounts, this traditional benefit would be reduced by around $7,800. But if the worker had a personal account, the balance of $161,500 would pay an annual annuity benefit of around $10,300, according to Mr. Biggs - meaning that, netted out, the personal account would increase annual benefits by approximately $2,500. "While today's retiree would have faced the subprime crisis and the tech bubble earlier in the decade, he also would have benefited from the bull markets of the 1980s and 1990s. The average return on his account - 4.9 percent above inflation - would more than compensate for a reduced traditional benefit," according to Mr. Biggs. Prior to the Bush plan, President Bill Clinton had a plan to transfer large sums of the projected $1 trillion budget surplus into the Social Security Trust fund and invest the funds in equities. That plan was rejected by Republicans and it came as the Monica Lewinsky scandal was consuming his presidency. Of particular note is that while the "slow moving" Senate is already moving toward building a consensus on policy, neither the House Budget Committee nor the Ways and Means Committee or the relevant subcommittees have held a hearing or even have one scheduled. While Mr. Obama's zeal is truly admirable, the first thing he should learn from his predecessors is that absolute-demagogic statements - like his condemnation of the Bush plan - will only lead to political disappointment and disaster. It is apparent from the last two election cycles that conservatives need to refresh their political appeal and develop innovative policy proposals aimed at solving real-world problems. We know the proportion of Americans 65 and older will expand dramatically - from about 12 percent in 2000 to almost 20 percent by 2030. One way to address this issue and promote retirement security is for policymakers to eliminate counterproductive provisions in Social Security and Medicare that discourage seniors from staying in the active workforce beyond age 65. The Cato Institute's daily podcast features senior fellow Mike Tanner talking about prospects for Social Security reform under the Obama administration. A new poll from the Pew Research Center finds that Americans name Social Security as one of the top five policy issues the new Obama administration should focus on. Sixty-three percent of those polled said the administration should make Social Security a "top priority," placing it fourth among 20 issues after the economy, jobs and terrorism. Other, often more touted issues, such as immigration, tax cuts and global warming, ranked far lower. Click here for more details on the poll. Being fair to future generations requires that Social Security be reformed in a manner that prefunds a significant share of future Social Security benefit payments. All serious reform plans have this property. Prefunding is done exclusively in the Social Security trust fund in some plans, and it is done partly in personal retirement accounts (PRAs) in others. The consequences of prefunding Social Security in the trust fund are controversial and not well understood. The key question is whether Social Security surpluses are offset by smaller non-Social Security surpluses; if they are, and if the offset is 100 percent, then Social Security surpluses are not truly saved and prefunding intended to make Social Security fair to future generations is neutralized by a non-Social Security fiscal policy that is less fair to future generations. This paper makes this important point concrete by simulating the response of non-Social Security fiscal policy to two alternative Social Security reforms that differ only with regard to the breakdown of prefunding in the trust fund and prefunding in PRAs. The reforms simulated are the Nonpartisan Reform Plan proposed by Jeffrey Liebman, Maya McGuineas, and Andrew Samwick, and a version of that plan that prefunds exclusively in the trust fund. If Social Security surpluses are not saved, it is found that NRP's PRAs increase the net benefits of government to future generations by about 0.6 percent of GDP; that is, future generations enjoy some combination of lower non-Social Security taxes and higher non-Social Security government spending that amounts to about 0.6 percent of GDP in every year. The paper also reviews budget politics over the past 30 years and concludes that there is a substantial probability that trust fund accumulations are largely offset by reduced non-Social Security surpluses. The implications of these findings for Social Security reform are explored. If budget politics precludes the possibility that Social Security surpluses are saved, then large dividends would be paid if an alternative means of effectively prefunding Social Security could be found. If politics also precludes that possibility, then it would be rational to compromise other Social Security reform objectives so as to reduce trust fund accumulations. Specifically, relative to a first-best reform with effective prefunding, smaller benefit levels would be appropriate. We've looked at the issue of "saving the surplus" here. Also, it seems important to me that Mariger examines the Liebman, McGuinea, Samwick plan, which is aimed at fiscal responsibility. One of the issues with the Bush reform proposal, and many other personal account plans, is that the "transition costs" associated with personal accounts would be financed with new borrowing. When that happens, personal accounts no more pre-fund future benefits than does the current trust fund structure. The devil is in the details. I'm likely to add more later once I have the chance to read more carefully. The average EU country would need to have more than four times (434 percent) its current annual gross domestic product (GDP) in the bank today, earning interest at the government's borrowing rate, in order to fund current policies indefinitely. At the low end, Spain would need to have almost two and one-half times (244.3 percent) its annual GDP invested. At the high end, Poland would need to have 15 times its GDP invested in real assets, forever! No EU government has made the necessary investment. The American Academy of Actuaries issued a statement today praising President Obama for pledging to take on Social Security and Medicare reform. applauds President Barack Obama's pledge to address Social Security's and Medicare's long-term financial challenges and urges public policymakers to reach bipartisan solutions to ensure both programs' viability. "Historically the American Academy of Actuaries has urged policymakers to address these financial challenges without delay," said John Parks, the president of the American Academy of Actuaries. "President Obama's message shows that he understands that these issues must be addressed now. And the Academy believes this must happen regardless of any other actions taken to address the current economic and fiscal crisis." said that the president is right to say that Medicare's issues cannot be solved "in isolation from the broader problems of the health care system." She said that policymakers must enact comprehensive Medicare reform not only to restore the program's solvency, but also to improve its long-term sustainability by lowering the growth of total Medicare spending as a share of the federal budget and of the overall economy. "It is important to recognize that the problem of rising health care spending in the Medicare program reflects the spending growth seen in the U.S. health care system as a whole," she said. "Unless that spending is addressed, implementing options to control Medicare spending will have limited long-term effectiveness. Medicare reform proposals should focus on options that reduce overall spending, rather than simply shifting costs from the government to another payer." Regarding Social Security, Tom Terry, the Academy's vice president for pension issues, said that the Academy released a statement in August urging policymakers to address to address the program's longterm actuarial imbalance by increasing Social Security's retirement age. "By acting now policymakers would have a full range of policy options to choose from," Terry said. "They will also be able to apply those options to more of the population, and give people more time to appropriately plan for retirement." President Obama's message came during a 70-minute interview with Washington Post reporters and editors on Jan. 15. For more information, please contact Andrew Simonelli, assistant director of communications for the American Academy of Actuaries, at 202.785.7872. For more information on the American Academy of Actuaries, please visit: www.actuary.org. While I'm not sure that addressing rising Medicare spending requires wholesale changes to healthcare provision in general – a point I touched on here – overall the Academy's support is very helpful in giving momentum to reform. Let's hope that Obama's Social Security experts – of whom the new administration has several – are listening. "While I'm not sure that addressing rising Medicare spending requires wholesale changes to healthcare provision in general – a point I touched on here"
So you are suggesting the drivers of health care cost growth in general are different for the Medicare and non-Medicare population? That said, because they have the same cost drivers does that necessarily they have to be reformed together. It is possible to have different cost structures for Medicare and other health services, and in any event Medicare pricing influences pricing elsewhere. There are a number of areas in which government programs and private sector industry work in parallel, and it's not clear why health care can't be one of them. Moreover, to the degree that Medicare and other government health programs influence the private sector, which is probably significant given that the government finances about 40 percent of health care spending economy-wide, it actually makes sense to start with Medicare, not end with it. So I think the argument that we first need wholesale reform of private sector health care -- which I fear may imply a slippery slope to government control of the overall health sector -- is overstated. Here's a link to my first post on NewMajority.com, which launched yesterday. It's a general thought piece on where Social Security and retirement policy has been, and where it may be heading. Check it out. Jenkins: Can Obama Make Government Solvent? Mr. Obama, in his campaign, already has adopted the Bush template for entitlement reform in all but name: Incentivize private savings funded by payroll tax givebacks. Leave it to future presidents to deliver the bad news (which workers already expect) that Social Security and Medicare will increasingly become means-tested supplements to private saving. Thinking more about blogging, I'm now planning on continuing to post here in parallel with NewMajority.com, with the more technical/wonky material being posted here and the more general readership material going to NewMajority, while being cross-posted here. The idea is to retain the outlet for more specialized material here, which people seem to appreciate, while making the more popular material available to a broader audience. So stay tuned here, but also go over to NewMajority.com for new and interesting political analysis. Read more! Over the next week or so this blog will transition to become part of a new group blog – NewMajority.com – founded by my AEI colleague David Frum. David is a thoughtful guy and has gotten a very interesting group together to participate. There will be opinion-based blogging as well as new reporting, so NewMajority should prove a good stopping point for all kinds of readers. While I'll blog on some broader topics, I'll continue to focus on Social Security, pensions, entitlements, social insurance and the rest. In particular, I'll talk about why the vision of social insurance programs can be going forward, and how to maintain the protections Americans desire consistent with the size of government they've traditionally preferred. In one sense, this may seem rather narrow – after all, there a many more issues than entitlements for policymakers to deal with. On the other hand, if we don't get on top of entitlement spending, the federal government will become – in Paul Krugman's phrase – a pension plan with an army. Until we can't even afford the army. Here's a press release with more details on the site and the great cast of characters who will be involved. WASHINGTON, Jan. 16 /PRNewswire/ -- The inaugural event for Republicans on Jan. 20 will not be the swearing-in of President Barack Obama; it will be the launch of NEWMAJORITY.COM (http://www.newmajority.com), a new voice for conservatives determined to renew and reform the Grand Old Party. Led by David Frum, former speechwriter for President George W. Bush and popular blogger for National Review Online, NewMajority.com will champion a responsive, responsible, inclusive, and environmentally-conscious conservatism." If the public rejects your party's message," Frum says, "it doesn't do much good to repeat that same message -- only louder." Frum is seeking a diverse, lively, and informed group of contributors who will shape a new conservatism to appeal to the crucial constituencies lost in recent years: the young, the college-educated, women, and minorities. On Jan. 20, 2009, NewMajority.com will celebrate its inauguration with contributions from Michael Powell, former chairman of the Federal Communications Commission; Ken Kurson, Rudy Giuliani's presidential campaign chief operating officer; Douglas Holtz-Eakin, domestic policy chief for Sen. John McCain's presidential campaign; Margaret Hoover of FOX News; Dr. Amanda Foreman, author of the best-selling biography, "Georgiana" (upon which the recent movie, "The Duchess," was based); John Gardner, former White House deputy staff secretary and general counsel to the Agency for International Development; Andrew Biggs, deputy administrator of the Social Security Administration; and Henry Olsen, vice president of the American Enterprise Institute. Frum himself will live-blog Barack Obama's inaugural address. The site will also offer a candid and in-depth interview with former presidential candidate Rudy Giuliani conducted by a man who knows the mayor intimately -- former chief Giuliani speechwriter and NewMajority.com contributor John Avlon. NewMajority.com will feature investigative reporting by Moira Bagley, a Capitol Hill insider on a journalistic mission to hold the new Congress and administration accountable. Frum says: "Mrs. Thatcher used to insist that the facts of life are conservative -- and our conservative journalism will be fact-based." Also appearing will be a growing roster of famous names -- and fresh young voices. Editor Frum is the author of six books, including most recently "Comeback: Conservatism That Can Win Again" (Doubleday, 2007). In 2005, he founded Americans for Better Justice, the group that led the opposition to the nomination of Harriet Miers to the Supreme Court. Frum is a member of the board of directors of the Republican Jewish Coalition and served as senior foreign policy adviser to Rudy Giuliani in 2007-2008. "I want to feature new voices on the site: young writers and writers from backgrounds not usually heard in the blogosphere," Frum says. "And we will try to build a new conservative online community by opening our site to civil and pertinent reader comments. It is often our readers who have the most interesting and informative things to say." Frum has recruited contributors from around the country. Some of those voices include Sarah Gannaway, wife of an Army officer wounded in Iraq, who will explain why Republicans have lost the support of many military families; "Jean Granville," the pen name of a senior French civil servant who will analyze why French TV is again broadcasting faked anti-Israel video footage; a young Indian in London, Kapil Kommedi, will blog on the emerging US-India relationship; rising young journalist Jamie Kirchick will argue why it's time for Republicans to make their peace with gay rights; an oil industry executive who will explain his industry under the pen name "Gusher;" and contributors who will deliver from the spot insight into the politics of Chicago, California, Texas -- and Afghanistan. Under David Frum's editorship, NewMajority.com will rapidly become the central forum in the gathering debate over the future of the Republican Party -- and an indispensable resource for anyone seeking to understand American politics. NewMajority.com goes live on January 20. I hope you all will be joining me there. reports that in a meeting with Post editors and reporters, President-elect Obama again pledged to take on the challenges of Social Security and Medicare. That discussion will begin next month, Obama said, when he convenes a "fiscal responsibility summit" before delivering his first budget to Congress. He said his administration will begin confronting the issues of entitlement reform and long-term budget deficits soon after it jump-starts job growth and the stock market. "…This, by the way, is where there are going to be very difficult choices and issues of sacrifice and responsibility and duty," he said. "You have to have a president who is willing to spend some political capital on this. And I intend to spend some." What strikes me is how much Obama's language on Social Security reform echoes that of President Bush, who also spoke of not kicking the can down the road, of spending political capital, and so on. To his credit, President Bush spent political capital on Social Security reform, but for a variety of reasons he didn't get very much in return – from the manner in which the Bush administration engage both Republicans and Democrats in Congress, to a desire on the part of Democrats to win a victory on an issue important to their governing vision, to an atmosphere of distrust built around the war, and to the general difficulty of ever reforming a large entitlement program. It's to be hoped that Obama and his economic advisors – some of whom were leading opponents of Bush's reform efforts – have taken away some lessons from the failed 2005 reform effort so the next round might be more successful. Within the next few years, Barack Obama is likely to fulfill his pledge to try to revamp Social Security despite the political pitfalls involved, financial experts said. That most likely means a package of tax increases and benefit reductions that would fall most heavily on upper-income wage earners. The Obama administration will attempt the first significant changes since the early 1980s because Mr. Obama needs to make substantial cuts in the federal deficit to assure financial markets spooked by the recession and the credit crisis. The recent financial crisis and resulting government bailout of Fannie Mae and Freddie Mac highlights the need for policymakers to be aware of the potential costs of implicit federal guarantees to quasi-private institutions. The Pension Benefit Guarantee Corporation (PBGC) is a self-financed arm of the federal government designed to insure private sector defined benefit pension beneficiaries against the bankruptcy of the sponsoring employer. However, the terms under which the PBGC grants insurance to pension programs are set by Congress, not the PBGC, and in several important respects encourage underfunding and excessive risk-taking by plan sponsors. We examine the history and status of the PBGC and propose both incremental and wholesale reforms to agency policies. The key to reform of the PBGC is to allow market signals to inform employees, policymakers and markets regarding the adequacy of funding of future pension obligations. Reform has become more important as policymakers have placed more attention on implicit liabilities of the government and as the auto industry's financial condition becomes more precarious. We also critically discuss on the PBGC's recent decision to take on more equity exposure in its investment policy. Click here for a pdf of the paper (draft) and here for the PowerPoint presented at the conference. Although the Social Security program is progressive--meaning that the replacement rate of preretirement earnings offered by Social Security tends to rise as lifetime earnings decline--this relationship is erratic. While individuals with lower lifetime earnings receive better treatment on average, lifetime earnings are only a weak predictor of how any one person will be treated by the Social Security program. Many high-earning households receive high replacement rates, and many low-earning households fail to receive them. Thus, Social Security is not entirely effective as a social insurance program protecting low lifetime wage earners against a meager retirement. In order to make Social Security more reliably progressive--thus protecting low-earning workers and allowing them to plan more effectively for their financial future--one possible approach would be to offer a flat dollar benefit for each retiree along with an individual account whose benefits are tied directly to contributions. A few charts give a feel for the main points, which I think are pretty important in policy terms. This first chart shows median Social Security replacement rates by lifetime earnings percentile. 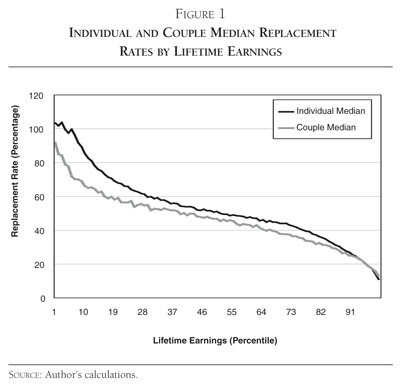 The slope of the line is negative, which means that as your lifetime earnings rise your replacement rate tends to fall. In other words, Social Security is progressive, on average. But only on average. The second chart shows actual data points for couple's replacement rates, taken from the GEMINI microsimulation model. 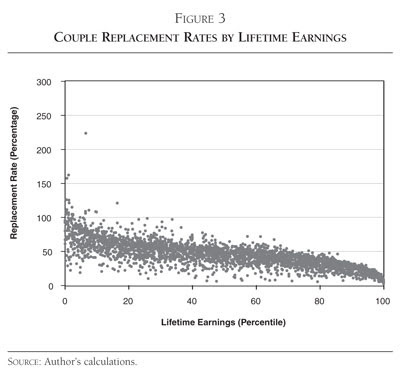 Even if the system is progressive on average, there's a ton of variation in replacement rates even for couples with the same lifetime earnings. 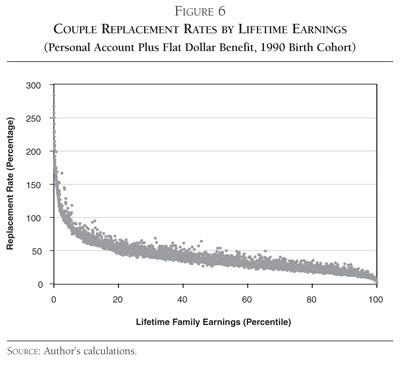 The reason is there are a ton of pieces of the benefit formula – wage indexing of earnings; the 35 years averaging period for earnings; the 10-years required for benefit eligibility and divorced spouse benefits; the 50 percent spousal benefit; the tax max, etc – that can make benefits very different even for individuals or couples with the same earnings level. There are a lot of low earners who receive low replacement rates, and a lot of high earners who receive high replacement rates. What's more, the variation in replacement rates rises for lower income people, who are precisely the ones who need social insurance the most. In other word, for low earners Social Security is like a home insurance policy that may or may not pay off if your house burns down – and sometimes pays off even if your house doesn't burn down. But now check out the third chart. This shows results from a stylized reform plan: every retiree receives a flat dollar benefit of $600 per month from Social Security. In addition, every worker has a personal account in which they save 3 percent of their earnings; these are invested only in government bonds. The key thing here is that average benefits are around the same as Social Security, and average progressivity is also around the same (meaning the slope of the line is the same, although extremely low earners do receive higher replacement rates here than Social Security). What's different is that there's much less variation in replacement rates: low earners consistently receive high replacement rates, and high earners consistently receive low replacement rates. What this shows is that for the purposes of social insurance, sometimes too much complexity actually makes things worse. A very simple and understandable reform plan can accomplish the social insurance purposes of Social Security better than current law. Reason No. 1: The public's appetite for private accounts is probably in the basement. Reason No. 2: We might be able to avoid a generation war. Reason No. 3: It's easier than health care. Reason No. 4: There is a Democratic Congress and a Democratic President. It's hard to argue with their reasoning: on paper, now seems to be a very good time for folks on the left to get a good deal on Social Security. That said, they shouldn't think that they're likely to get whatever they want. Remember, in 2005 President Bush had just come off an election victory and Republicans controlled both houses of Congress, yet reform went nowhere. It's much easier to play defense on Social Security reform than offense. I think the Democrats demogogued Bush's reform plans, but Republicans are just as capable of doing the same to Obama. For that reason, a true bipartisan reform effort is the only one likely to succeed. If your year-end 401(k) statement made you ill, I have one consolation for you: It could be worse. How's that possible, given how horrible last year was for investors? Simple. If you're not close to retirement, you've got time to recover. If you're in the retirement-age zone, as I am (I'm 64), at least you've got the option of hanging on until things get better. If you're in the mandatory-withdrawal part of life (older than 70 1/2 ) or just need some retirement cash, you can take a minimal distribution this year and hope for the best. If, however, you were forced to buy a lifetime annuity with your current balance -- when you buy such an annuity, you trade your cash for a series of guaranteed payments for the rest of your life -- you'd be making your loss permanent. That's how things could be worse. First, as I showed in this paper, people retiring under current market conditions actually wouldn't have done all that badly. Assuming a plan similar to President Bush's, the typical worker's total Social Security benefit would have increased by around 15 percent. While Sloan's anecdotal evidence is compelling, in doing this paper I found that you really need to run the numbers. Second, Sloan says that people would be "forced to buy a lifetime annuity" with their personal account balances, thereby locking in the poor returns of the past few years. Um, except that they wouldn't. Both the 2001 Social Security reform commission and President Bush's reform proposal allowed for scheduled withdrawals instead of immediate annuitization. Third, Sloan later says that the Bush plan would "force people to depend on the markets for money to meet basic needs." Again, except it wouldn't: no one under the Bush proposal (or most other account plans, for that matter) would be forced to take a personal account, and no one holding an account would be forced to invest even a penny in the stock market. Allan Sloan's stuff is usually quite interesting, but this is a bit sloppy on the facts. In the comments over at Angry Bear, Bruce Webb brings up a common argument regarding Social Security reform and personal accounts: that Social Security's projected insolvency is due to low economic growth, but if the economy grows slowly then stock returns will also be low, and so personal accounts investing in stocks can't really do anything to help Social Security or Social Security beneficiaries. I've got some sympathy for the economic growth/stock returns argument in theory (short story: future economic growth will be lower because birth rates/labor force growth will also be lower; this can lead to capital deepening, such that the ratio of capital to labor rises; this in turn leads to lower returns on capital). Although, Kotlikoff, Smetters and Walliser make an interesting opposite argument, that rising entitlement spending due to population aging will soak up so much excess capital that stock returns are likely to rise. Moreover, as I argue here, I think the rate of return argument pitting personal accounts against Social Security is generally wrong. But anyway, here's some data I haven't seen around before that some might find interesting. If you do believe that economic growth and stock returns should be strongly correlated, at least over the long term, then you'd think that if you compared long-term economic growth/stock returns from a number of countries that we'd see a tight fit. The chart below shows average annual GDP growth and average real stock returns for 16 countries in the period 1900-2000. (The equity returns are from Dimson, Marsh and Staunton; the GDP growth is from Maddison.) The regression shows there is a positive relationship on average, such that average equity returns equal 1.96 percent plus 0.92 times the country's rate of GDP growth. Short story: higher GDP growth should mean higher equity estimate. The problem here is that the fit of the regression is pretty poor: the R-squared value is 0.1, meaning that about 10 percent of the difference in equity returns between countries is accounted for by differences in their rates of GDP growth. The rest of the differences are due to other things. So from this chart (and the discussion above) we can conclude that while the economic growth/stock returns argument has some merit, it's not the major driver of things. Matt Miller writes in the Wall Street Journal today that even Republicans admit that taxes are likely to rise – a lot – as the population ages and entitlements start to squeeze the federal budget. As 76 million baby boomers hit their rocking chairs, we're poised to double the number of seniors on Social Security and Medicare. We've already got $50 trillion in unfunded liabilities in these and related programs. There's no way to make the math work at current levels of taxation. Don't take my word for it. Listen to some of today's pre-eminent Republican budget analysts, who've told me that taxes are going up no matter who is in power. Like every Republican who aspires to serve in a public role, they've been schooled by the party's antitax police to avoid saying things too definitively, or to leave themselves an "if we only got tough on spending" escape hatch. We know this spending talk is a charade, though, because Republicans balked at trimming a few teensy billion from the next trillion in planned Medicaid outlays when they controlled every corner of Washington a few years ago. So there's no mistaking what these folks are saying. Miller's piece is good and in all likelihood he's correct. First, if every American should save responsibly for retirement. If we all did that, then Social Security could serve as a backstop for those who are so poor that, even if they did save, wouldn't have enough for a decent income in retirement. As it stands, Social Security isn't just about helping out the poor, it's about providing retirement incomes to people who could easily provide them for themselves. That may be affordable today, but it won't be in the future. Second, if the American health system's efficiency were improved to match the best programs around the world. While there are many ways to skin the cat and there's no reason we need to have the same health approaches as other countries, U.S. health care is, some argue, uniquely inefficient. As the budget is squeezed I have no doubt that Americans will start to save more on their own and that U.S. health care will become more cost-conscious. But the key would be to start doing these things before we go bankrupt – a soft landing is better than a hard one. Social Security imposes a "net tax" on most workers, meaning that they will pay more into the system than they'll receive out of it. This negative "income effect" will tend to encourage people to work more, since their lifetime wealth will be reduced and they'll try to make up for it. Since benefits are based only on the highest 35 years of earnings, marginal tax rates on work years above 35 years can be very high. This would encourage early retirement. Since the lower-earning member of a married couple can receive spousal benefits equal to 50% of the benefit earned by the higher-earning spouse, the taxes paid by the lower-earning spouse often go to waste. This implies a very high marginal tax rate for lower-earning spouses. The Treasury brief then goes on to discuss potential reforms to improve incentives to work and delay retirement. Can people delay Social Security retirement? In the past, they did. One of the most prominent reforms for Social Security is to increase the retirement age, which would require people to work longer to get the same level of benefits they do today. For instance, until 2000 the full retirement age was 65, since then it's moved to 66, and by the early 2020s it will increase further to 67. 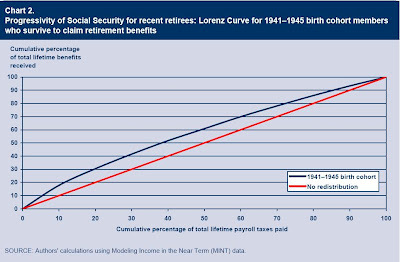 In a way this makes sense, both since Social Security is insolvent and since people are living longer. One counterargument for raising the retirement age is that people can't work longer, due to health reasons or the types of jobs available in the economy. While there's no way to prove this one way or the other, there's one interesting piece of evidence that most people don't about: in the past, most people delayed claiming Social Security far longer than people do today. The chart below is drawn from SSA data (available here). It shows that in 2005 the average age at which people claimed retirement benefits was around 63.7 year. The most common age of claiming is 62, but some people claim later. However, the chart also shows that in the past, most people waited several years longer to claim benefits. In the 1950s, for instance, the typical person did not claim benefits until age 68. The reasons for this are primarily that you could not collect retirement benefits at all until age 65 and that there was a stricter retirement earnings test that limited or eliminated benefits for retirees who continued to work. But the point is that the 1950s were in many ways a harder time for someone to delay retirement. Life expectancies and health were worse than today. The typical 65 year old in 1955 could expect to live around 14.9 extra years, while today a typical 65 year old can expect to live an additional 18.8 years. Moreover, jobs in the 1950s were far more physically demanding than those today – think steel mills, mines, and so forth. While the fact that people in the 1950s delayed retirement is no guarantee that Americans today can, it's certainly evidence in that direction. P.S. Note the steep decline in claiming ages beginning in the mid-1950s for women and early 1960s for men. This was when early retirement at age 62 first became available. 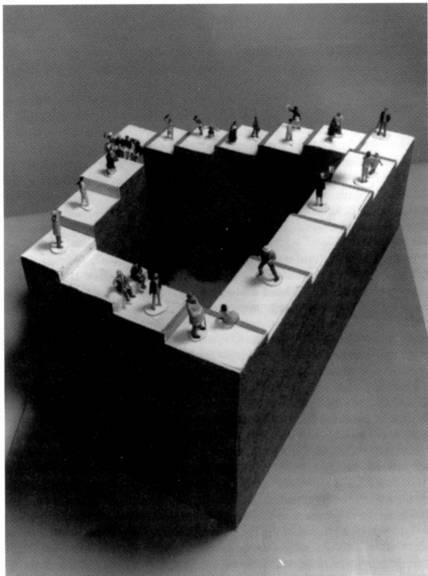 There is another way, however, at least with Social Security…. That way is privatization. Obama's party lashes out when even partial privatization is brought up. But taking retirement out of government's hands works. It has worked in Chile. It has worked in Britain. It's worked, as well, in Texas, where in 1981, Galveston County employees voted 78% to 22% to opt out of the Social Security system and put their trust in a private retirement plan. Brazoria and Matagorda counties followed Galveston out of Social Security before Congress outlawed in 1983 the option of leaving Social Security. Now more than 5,000 Texas participants are in a private plan where the rate of return far exceeds that of Social Security's average of 1.25%. The Institute of Policy Innovation, a Texas think tank, reports that a low-income worker making $17,124 a year and retiring at 65 will get $782 per month from Social Security while someone with an identical salary retiring at the same age would receive $1,285 a month from the plan the Texas county workers invest in. A retiree who earned roughly $51,000 a year will get $1,540 monthly from Social Security, $3,846 from the Texas plan. I'll stick to the Galveston example, since it's the cleanest illustration of why straight comparisons of Social Security to a personal accounts plan can be misleading. For background, until the early 1980s local municipalities were allowed to opt out of Social Security and set up their own plans, much as many state and local workers had never been in Social Security in the first place. While most municipalities set up defined benefit plans, Galveston, Texas was an early adherent of defined contribution plans, aka, personal accounts. Under this plan, workers invest a portion of their salaries in accounts holding market investments, and draw down their accounts to provide income in retirement. And, it is true that in general these accounts pay a higher return and higher benefits than Social Security. So what's not to like? The problem is that what can be done for a few people, like workers in Galveston, can't be done for everyone. Here's why: Social Security is a transfer system, meaning that today's taxes immediately pay for today's benefits. If people decide to invest their taxes in personal accounts, there will be a continuing "transition cost" to maintain benefits for current retirees. Now, if a very small group of workers is allowed to opt out, the rest of the system can effectively carry their transition costs without anyone noticing. That's what happened with Galveston: the rest of us are paying to finance Social Security benefits for retiree in Galveston, which allows workers in Galveston to invest their payroll taxes privately and earn higher returns. For a small group, it's not a problem, even if it raises questions of fairness. But if everyone did this the transition costs couldn't be swept under the rug. And those transition costs are very large: Social Security currently owes around $17 trillion for benefits that have been earned but not yet paid out. If we levied a surtax to finance those benefits, the total rate of return earned under a private account plan would be almost exactly the same as under Social Security. The argument that personal accounts would pay a higher rate of return – that they would "make Social Security a better deal" – is intuitively attractive but ultimately counterproductive because it encourages people to avoid the hard choices involved with Social Security reform. There are a number of good reasons to support personal accounts, but a higher rate of return isn't one of them. A member of my family who will remain nameless thinks that if chicken-fried steak is good – and let's assume it is – that chicken-fried-steak-fried-chicken would be even better. Regardless, the incoming Obama administration seems to have a similar attitude toward cutting payroll taxes to stimulate the economy, at least according to a story in this morning's Washington Times. I've already argued in the WSJ that President' elect Obama's proposed tax cuts – the ones that go to 95 percent of the population, according to the campaign phraseology – was really a cut in Social Security payroll taxes. The tax could would equal 6.2 percent of earnings – the employee share of the 12.4 percent Social Security tax – up to maximum earnings of $8,000 per year, for a total tax cut of $500 per person. But the tax cut would be in the form of a refundable income tax credit based on payroll taxes, meaning that in effect income tax revenues would be used to compensate the Social Security trust fund for any losses. But this morning's Washington Times article goes further: according to the Times, the Obama tax cuts would not – like other refundable income tax cuts – be payable as a, well, refund when people file their taxes. Instead, Obama's planners want the tax cut paid out a little at a time through every paycheck – as a reduction in payroll taxes. This reminds me of one of those M.C. Escher prints where the stairs go around and around until they meet up at the start. There is no reason other than to obscure the accounting not to simply call this a payroll tax cut with losses to Social Security financed through income taxes. But calling it that might draw too many similarities to President Bush's 2005 personal accounts plan, which most Democrats condemned in the strongest possible terms. Under Bush's plan, workers could take around a third of their Social Security taxes – in effect, a payroll tax cut – and invest that money in a personal retirement account. Payroll tax reductions to Social Security would be covered through general revenue transfers in the short term. This was condemned as weakening the system and it was pointed out that there were no income tax surpluses to transfer, meaning that the plan would require new borrowing. Once account holders retired, however, they would accept a reduced traditional Social Security benefit; this would allow transition borrowing to be repaid. The Obama proposal is effectively the same, except that the payroll tax cuts would be spent, not saved, and that there would be no means of repaying the tax cut later. In other words, the Bush plan had temporary borrowing and additional saving for retirement, while the Obama plan has permanent borrowing and no additional saving. Obama to take on Social Security? "President-elect Barack Obama said Wednesday that overhauling Social Security and Medicare would be 'a central part' of his administration's efforts to contain federal spending, signaling for the first time that he would wade into the thorny politics of entitlement programs." Obama provided no details of his plans for entitlements, but said his proposed budget in February would have more to say on the subject. This could be pretty significant. On one hand, I and many others were critical of Obama's policy stand on Social Security during the election, as his proposed "solution" – a 2 to 4 percent payroll surtax on earnings over $250,000 – would address only around 15 percent of the long-term deficit. Meanwhile, Obama had ruled out any other changes to benefits, taxes, or the retirement age. This didn't give him much room to put together a plausible reform plan. But the current and projected fiscal situation, with multi-trillion dollar deficit leading into the crush of Baby Boom entitlement spending increases, should mean that past positions should be reconsidered. If Obama and has staff – which includes Social Security experts Peter Orszag and Jason Furman – are rethinking how to address Social Security and looking to move it toward the front burner, that's to be commended. They may have a challenge in convincing Congressional Democrats to go along, but projected deficits are so large that their chances of doing so may be improved. The challenge for Republicans will be to resist the temptation to demagogue and attack rather than to work together toward a solution. This temptation understandably will be strong, given that demagoguery and attacks were produced in spades by many Congressional Democrats during the 2005 reform debate. But the goal here is solutions. If President Obama is willing to do his part, those on the right should do theirs. It's said that hypocrisy is vice's tribute to virtue – an acknowledgment of what we should do, even if we don't always do it. The Medicare funding "trigger" mechanism is a good example: while it hasn't accomplished anything to date, the fact that it even exists is hopeful. Yet this week House Democrats instituted new rules that would silence the Medicare trigger, allowing the House to continue ignoring rising Medicare spending. The Medicare trigger requires that the president submit and Congress debate measures to slow Medicare spending if for the prior two years more than 45 percent of Medicare's total funding has come from general tax revenues, as opposed to payroll taxes or premiums paid by seniors. The trigger is hypocrisy because it was included in the 2003 law that established the Medicare prescription drug ("Part D") program, a long-term budget-buster that was funded – yes – largely from general tax revenues. Yet the "tribute to virtue" part was that at least it forced Congress and the President to acknowledge that costs were rising and discuss ways to hold down those cost increases. House Majority Leader Steny H. Hoyer – a fiscal conservative among the Democratic leadership, if that makes you feel any better – called the trigger "an ideologically-driven target based on a misleading measure of Medicare's financial health." Now, in one sense he's right, in that there's nothing inherent in Medicare's financing such that general revenue financing above 45 percent implies something different than general revenue financing of 44 percent, and so on. But this points out one of the key problems with Medicare relative to Social Security, that Medicare has an almost unlimited call on general revenues while Social Security can rely only on payroll taxes. Whatever you may think of the Social Security trust fund, at least it provides the fiscal discipline that benefits can't exceed taxes over the long term. Medicare has a much more limited brake on spending, so it's not clear what a non-misleading measure of Medicare's financial health would be. Given that, the level of general revenue financing in Medicare is a proxy for overall cost increases in the program, which everyone of good sense acknowledges are rising far faster than the federal budget can allow. While 45 percent general revenue financing is an arbitrary number, it at least forces Congress and the President to propose and debate solutions to rising Medicare costs. The House can stifle the Medicare trigger based on its internal rules, without passing legislation. The trigger would still apply to President Obama, but Congressional Quarterly reports that the new administration may choose to ignore it. While at Social Security I was peripherally involved with the Medicare Trustees Report, which is constructed alongside the Social Security report using the same staff and through the same meetings. While the Medicare trigger isn't directly Social Security-related, the seriousness with which Congress and the new Obama administration treat the trigger signals the overall level of importance they ascribe to entitlement reform. Sadly, it seems that one of the first steps of the new Congress will be to silence one of the few warnings regarding the looming fiscal gap. This hardly bodes well for overall entitlement reform. Note: Ed Morrissey of Hot Air weighs in here. Hot Air blogger Ed Morrissey lays into President-elect Obama's plans to rebate Social Security payroll taxes to help stimulate the economy – but without affecting the trust fund. This reminds Morrissey of the reform debate in 2005, in which President Bush proposed allowing workers to invest part of their Social Security taxes in personal accounts, and would transfer general tax revenues to the trust fund to make up the difference. Morrissey points out – correctly – that many who now support Obama's tax cut attacked the financing of Bush's reform plan, although the two are really pretty similar. I hit on some related points in this Wall Street Journal piece from a while back. In any case, Morrissey's post is well worth checking out. Social Security COLA as economic stimulus? writes that the 5.8 percent Social Security COLA – the biggest since the early 1980s – couldn't have come at a better time. While a new Congress and a new White House debate details of an economic stimulus plan, Social Security recipients are already reaping a $38 billion windfall …. "If they perceive they're getting a raise in their Social Security benefits, it should have a stimulative effect," says Andrew Biggs, a former deputy commissioner for the Social Security Administration and a resident scholar at the American Enterprise Institute. "Seniors seem to be very pleased that they're getting such a large COLA," Biggs says. It's important to note that perceptions are a big issue here. The Social Security COLA is perceived by many seniors and the press as a "raise" when it fact it exists merely to keep the purchasing power of Social Security benefits from falling. However, the fact that this large nominal increase in Social Security benefits is occurring at a time when prices are actually dropping, since last year's high inflation has been followed by deflation in recent months – may cause seniors to feel their incomes are rising. If so, they may choose to spend a bit more. National saving rates differ enormously across developed countries. But these differences obscure a common trend, namely a dramatic decline over time. France and Italy, for example, saved over 17 percent of national income in 1970, but less than 7 percent in 2006. Japan saved 30 percent in 1970, but only 8 percent in 2006. And the U.S. saved 9 percent in 1970, but only 2 percent in 2006. What explains these international and intertemporal differences? Is it demographics, government spending, productivity growth or preferences? Our answer is preferences. Developed societies are placing increasing weight on the welfare of those currently alive, particularly contemporaneous older generations. This conclusion emerges from estimating two models in which society makes consumption and labor supply decisions in light of uncertainty over future government spending, productivity, and social preferences. The two models differ in terms of the nature of preference uncertainty and the extent to which current society can control future societies' spending and labor supply decisions. Since 1980, the U.S. net national saving rate has averaged less than half the rate observed in the 1950s and 60s. This paper develops a unique cohort data set to study the decline in U.S. national saving. It decomposes postwar changes in U.S. saving into those due to changes in cohort-specific consumption propensities, those due to changes in the intergenerational distribution of resources, those due to changes in government spending on goods and services, and those due to changes in demographics. Our findings are striking. The decline in U.S. saving can be traced to two factors: The redistribution of resources from young and unborn generations with low or zero propensities to consume toward older generations with high consumption propensities, and a significant increase in the consumption propensities of older Americans. Most of the redistribution to the elderly reflects the growth in Social Security, Medicare, and Medicaid benefits. The increase in the elderly's consumption propensities may also reflect government policy, namely the fact that Social Security, Medicare, and Medicaid benefits are paid in the form of annuities and that, in the case of Medicare and Medicaid, the annuities are in-kind and must, therefore, be consumed. In other words, we're saving less in large part due to entitlements, which are unfunded transfer programs from younger to older Americans. The same process is taking place abroad, the current Kotlikoff, Dobrescu, and Motta paper concludes. For instance, Wang and Preston conclude that while current SSA mortality projections assume a 50-year-old man in 2034 has only a 39 percent chance of living to age 85, an estimate that includes smoking would put the likelihood of surviving to 85 at 57 percent. A couple thoughts: first, Wang and Preston's paper builds smoking into the Lee-Carter model of mortality, which already projects longer life spans than does SSA. Perhaps a third of the difference between the Wang-Preston estimates of life expectancies and SSA's are simply due to starting with a model that already projects lower mortality. The remaining two-thirds or so is based on Wang and Preston's modeling of smoking. Second, it's not easy to translate the results in the Wang-Preston paper into an estimate of how much larger Social Security's deficit would be were Wang and Preston's estimates to prove correct. A reasonable guess is that adding smoking to the baseline Lee-Carter estimates would place mortality reduction close to the "high cost" projections of Social Security's trustees (their main projections are known as "intermediate cost"). Were the high cost projections for longevity to hold, and all other economic and demographic projections remain at their intermediate cost values, Social Security's 75-year shortfall would increase from 1.7 percent of taxable payroll to around 2.3 percent, an increase of 35 percent in the size of the long-term deficit. At the least, this study shows a) that considerable uncertainty exists regarding improvements in future life spans, and b) that Social Security's finances are very sensitive to changes in longevity, more so than to other factors such as economic growth. Rasmussen Reports polling has interesting new survey data on public attitudes toward Social Security and Social Security reform. A plurality of likely voters surveyed in late December say that working-age Americans should be allowed to opt out of social security (46% to 38% opposed). Interestingly, however, almost the exact same percentages believe that Social Security is a good deal for current workers. This seems to imply that while Americans think workers should have the option to drop out of Social Security, many people wouldn't actually choose to exercise that option if allowed. This again is interesting, given that 55% of voters surveyed are either not very confident or not at all confident in receiving their promised Social Security benefits. Only 39 percent are somewhat or very confident in getting what they've been promised. While the cross-tabs aren't available online, it's likely that confidence is highest among those who are currently or about to retire, with younger Americans less confident in the system. The poll had mixed results for President-elect Obama's plans for Social Security reform. Consistent with other survey data, a majority of 60% favor applying the Social Security tax to earnings above the current payroll tax ceiling of $106,800 for 2009. Imposing a new payroll tax on earnings above $250,000 was the centerpiece of Obama's plans for Social Security, so these results indicate support for his proposal. However, 62% believe that workers paying more taxes should also be award more benefits. This is consistent with Social Security's historical practice, in which taxes and benefits have always been based on the same wage base, in effect meaning that higher taxes have always implied higher benefits. even if no additional benefits are paid. If additional benefits were paid on the higher taxes, as past practice and public opinion seems to support, then the improvement in Social Security's finances would be even smaller. In others, the tax policy most consistent with public attitudes leaves a very large financing hole to be filled. Public attitudes toward Social Security and reform are obviously a mixed bag for both sides of the political aisle. While no solution will be easy, it may become easier by broadening the debate and opening a larger number of policy options for the public and Congress to think over. A key question for Social Security reform is whether workers currently perceive the link on the margin between the Social Security taxes they pay and the Social Security benefits they will receive. We estimate the effects of the marginal Social Security benefits that accrue with additional earnings on three measures of labor supply: retirement, hours, and labor earnings. We develop a new approach to identifying these incentive effects by exploiting five provisions in the Social Security benefit rules that generate discontinuities in marginal benefits or non-linearities in marginal benefits that converge to discontinuities as uncertainty about the future is resolved. We find clear evidence that individuals approaching retirement (age 52 and older) respond to the Social Security tax-benefit link on the extensive margin of their labor supply decisions: we estimate that a 10 percent increase in the net-of-tax share reduces the two-year retirement hazard by a statistically significant 2.1 percentage points from a base rate of 15 percent. The evidence with regards to labor supply responses on the intensive margin is more mixed: we estimate that the elasticity of hours with respect to the net-of-tax share is 0.41 and statistically significant, but we do not find a statistically significant earnings elasticity. The short story is that the authors conclude that we can reject the view that participants are completely unaware and unresponsive to the incentives presented by Social Security. As a result, gains from shifting to a more transparent means of Social Security benefit accumulation – namely, personal accounts – may be smaller than previously believed. A couple quick thoughts: First, marginal returns paid by Social Security to near-retirees are in general very low. Based on forthcoming work with David Weaver and Gayle Reznick of SSA, we found a median marginal return from an extra year of work of around -50%, which implies that continued work isn't a particularly good deal for most retirees. That said, there is a range of marginal returns, and from this range it should be possible to back out differences in labor force participation, as Liebman, Luttmer and Seif do. Second, while personal accounts potentially present clearer work incentives, in practice that's often not the case. Most personal accounts plans layer accounts over the current benefit formula (usually amended in some way to achieve solvency). As a result, participants would face all the incentive problems under current law Social Security, as well as any issues raised by the accounts. I suspect most workers would have a difficult time figuring out what their incentives were. As policy, clarifying and improving work incentives under Social Security should be a major priority, but it will take relatively large fixes to the benefit formula to get things right.